Waipukurau couple Trevor and Debbie Walters have been “living a dream” as the major shareholders in outstanding mare Melody Belle, winner of five Group 1 races this season and seemingly assured of the title of New Zealand Horse of the Year. The Walters own a 10% share in the Commands mare, who took her career tally to 11 wins from 20 starts and her stakes earnings to more than $1.6million when taking out the Group 1 $200,000 Bonecrusher Stakes (2000m) at Ellerslie on March 9. 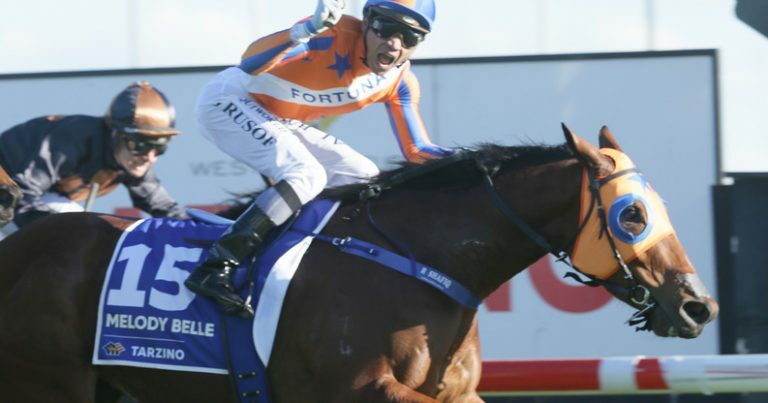 Melody Belle is officially owned by the Fortuna Melody Belle Syndicate, which is managed by Auckland’s John Galvin. There are 34 individuals involved in the ownership and the Walters have the biggest shareholding. They are the only Hawke’s Bay people involved. “Trevor and Debbie have a 10% share and the next biggest shareholder is a person in Australia with an 8% share,” John Galvin said. Trevor Walters got his wish come true when Melody Belle won the Karaka Million at Ellerslie in January 2017 but unfortunately he and Debbie were not on course to witness the win. “We also missed her last win in the Bonecrusher Stakes because we had booked another trip to Aussie to see the Eagles concert. We watched the race in the Crown Casino in Melbourne and were standing next to Des Coppins’ brother to watch the race on TV. “I said to him I might get a bit excited over the final stages of this race because I’ve got a share in one of the runners. He said which one and when I told him he said don’t worry she’ll win she’s the best horse in New Zealand. “It was a shame we weren’t there to see that win but we had booked all our flights to Aussie and accommodation so we had to go. We don’t like missing being on course when she races and we even went to Brisbane in her two-year-old year and saw her win the Group 2 Sires’ Produce Stakes at Eagle Farm,” Walters said. Melody Belle, prepared perfectly by Jamie Richards at Te Akau Racing, has shown that a horse placed properly can compete and win at the elite level from the beginning of spring right through to late summer. She won the Group 2 Lisa Chittick Foxbridge Plate (1200m) at Te Rapa back on August 18 last year and has basically continued an amazing run of form since. She took out the first Group 1 race of the season, the $200,000 Tarzino Trophy (1400m), on the first day of the Hawke’s Bay spring carnival on September 1 and returned to Hastings three weeks later to take out the Group 1 Windsor Park Plate (1600m). She was then given a freshen up before resuming with a close third in the Group 1 Railway Stakes (1200m) at Ellerslie on January 1 before turning in probably the worst performance of her career when 16th out of 18 in the Group 1 Telegraph Sprint (1200m) at Trentham on January 19. Some trainers would turn their horse out for a spell after such a disappointing run but Richards had belief in the mare and put that run behind him, lining her up in the Group 1BCD Sprint (1400m) at Te Rapa three weeks later which she took out narrowly from Bostonian and Ardrossan. It was a real gut-busting run as Melody Belle looked likely to only run third or fourth when lengths off the leaders early in the home straight but lifted in the final stages to get up and win by a head. That was the first of another three Group 1 wins for Melody Belle this season, the next being the Haunui Farm Weight-for-Age (1600m) at Otaki on February 23 and then the Bonecrusher Stakes at Ellerslie earlier this month. Melody Belle was bred by one of New Zealand’s most successful single person thoroughbred breeders, Marie Leicester, and was sold as part of the Haunui Farm draft at the 2016 Karaka yearling sales for $57,500. Trevor Walters said it cost him and his wife about $11,000 for their 10 per cent share, once administration costs and insurance were added on. The Walters now have shares in another horse syndicated by Te Akau, a three-year-old filly by Sebring out of Irish Belle called Dolce Amore. She is a half-sister to the Group 1 Telegraph Sprint winner Irish Fling. “She finished third in a trial at Matamata the other day and is likely to have another trial before going to the races,” Walters said.